Biotechnology in Germany is a growth engine. In 2016, all key figures such as employees, turnover and R&D expenditure were at an all-time high. Among the drivers are medical innovations, but also an upward trend of green chemistry. 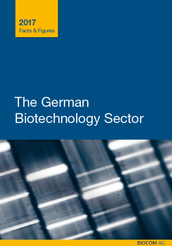 The report provides an overview to the current status of the German biotechnology sector. The figures and data presented are based on a biotechnology company survey which has been conducted by BIOCOM for the 11th time via the information platform biotechnologie.de.